It's 10 times stronger than any other like it. British and Czech scientists have unveiled a new “super laser” that they claim is the most powerful pulse laser available today. The laser was developed by Britain’s Central Laser Facility (CLF) and Czech research and development project HiLASE (high average power pulsed laser). The 22-ton device has been dubbed Bijov after a mythical Czech strongman, and it cost $48 million to build. Bijov has an average power output of 1,000 watts — a world record for pulse lasers. It first crossed this “magical barrier” on December 16, 2016, and HiLASE physicist Martin Divoky told AFP that it is “10 times as powerful” as any other laser of the same type. 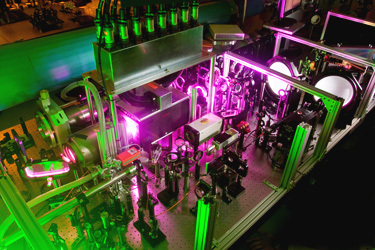 Some pulse lasers have a peak power output of over a trillion watts, like the one petawatt (one million billion watts) Texas Petawatt Laser or the two petawatt Fast Ignition Experiments (LFEX) in Osaka, Japan. However, this output is only possible because they build up power before releasing it in a single, very short burst and require lengthy charging cycles between shots. Therefore, while they can achieve very high outputs, they can only do so a few times per day; Bijov, however, is capable of firing more frequently. Achieving this world record for a pulse laser is significant, but more importantly, this breakthrough means we now have the kind of technology that will “transform the application of high power, high energy lasers,” according to CLF director John Collier. Bijov could prove to be revolutionary for fields such as engineering, in which the laser could be used to harden metal surfaces, process semiconductors, or micro-machine materials. The team is hopeful that they will be able to commercialize the laser later this year and has tests scheduled for the end of the month at which time they hope to further study the laser’s potential.